Writer-director J.C. Chandor's debut feature film, "Margin Call", is a tense, smart and surprisingly even-handed thriller that recreates the type of back room and boardroom skullduggery that led to the global economic meltdown of 2008. With the Occupy Wall Street movement sweeping the nation, Chandor couldn't ask for better timing. 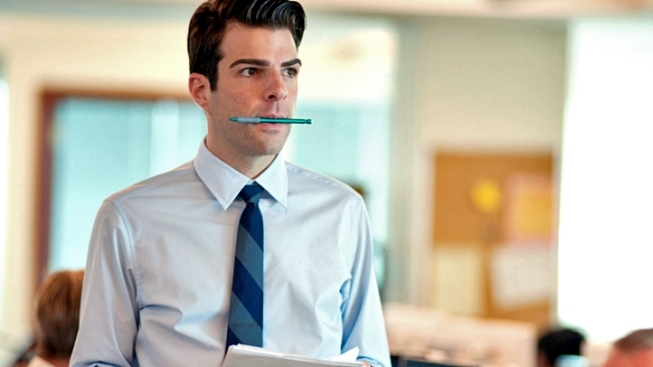 In Chandor's mythical trading firm, a young risk analyst, Peter Sullivan (Zachary Quinto), comes across a treasure trove of data that suggests the firm is leveraged beyond all reasonable levels, and is little more than a house cards waiting for the first stiff breeze to blow it all away. As the discovery inches its way up the food chain, the recriminations heat up, with each person brought into the loop jockeying for position, desperate not to be the inevitable sacrificial lamb, while at the same trying to determine the best course of action. When their efforts hit a roadblock, they have to call the grown-ups and soon there's a dead-of-night board meeting led by John Tuld (Jeremy Irons). Structurally, "Margin Call" owes a huge debt to "Glengarry Glen Ross"—without the dizzying profanity—but instead of a whodunit, the film is a howtheygonna? Tuld wants to unwind the firm's massive and worthless positions, while Sam Rogers (Kevin Spacey), a 34-year veteran of the firm, says to do so would be unconscionably unethical. The struggle between the two men speaks to one of the great problems at the root of the way Wall Street works: an inherently conflicted sense of what's "right." We experience the story mainly through the eyes of Peter, the ex-rocket scientist who sounds the alarm. But he's got way too much perspective to be a real person. As he trolls the city in a limo, he presses his head against the glass and says aloud, "Look at these people, wandering around, with absolutely no idea…" But it's Paul Bettany as Will Emerson, one of Peter's superiors, that speaks for the traders. Bettany gives one of his best performances ever, as a man whose life is a stream of anxiety punctuated by Nicorette and cigarettes. Of the little people, the civilians of the world whom Peter laments have "absolutely no idea," Will says, "F*** 'em," noting how happy they were to feed blindly on the scraps that flew from the trough as the bankers and titans gorged at the trough. Demi Moore, Zachary Quinto, Stanley Tucci, Penn Badgley, Simon Baker and Paul Bettany hit the red carpet for their new movie, "Margin Call," in New York City where the cast talks about the timeliness of their film and the Occupy Wall Street protests. 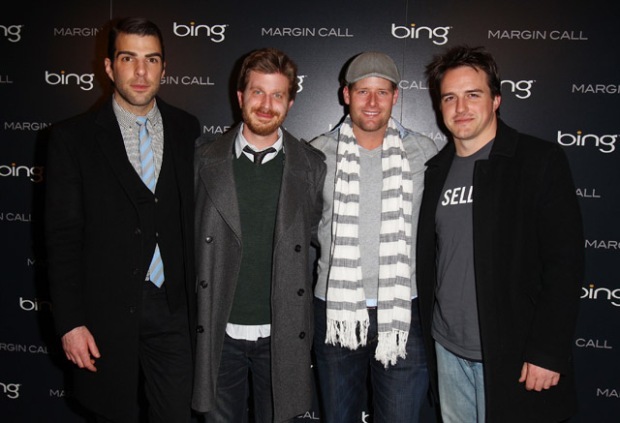 Chandor's work behind a camera don’t quite match his work behind a keyboard, but no matter, "Margin Call" is an engrossing drama that skillfully puts a human face on the crime of the century.